If you have a young kitty, practice periodically by opening her mouth and placing a small piece of canned food on her tongue so that she gets acquainted with the idea of putting something in her mouth. If she co-operates, give her a treat. This way, when she gets ill in the near (although we do not wish that to happen!!! ), she will readily accept the treatment. When you are ready to administer oral treatment to your cat, get all the cat supplies together before bringing your feline. Take out the pill from the veil or check the correct measure of liquid treatment. Get your treats, towel, any helper and then bring the feline. The easiest way to give your cat a pill or liquid is by placing her on a flat surface with her face facing away from you. Pull her backside close to your body, so that she does not get the opportunity to back up. Use one hand to grasp the head of the kitty. Put the hand over the top of her hand, such that it seems that it is like a winter cap with ear flaps. Keep your thumbs and fingers wrapped around the robust cheek bones which will assist you gaining control over her. Smoothly guide her chin into the air, which will cause her jaw muscles to relax. It will then make it much easier for you to open her mouth. Use your middle finger to open her mouth. Swiftly, pop up the pill as far back in the mouth of the feline as possible. You can slide it forward off your thumb towards the back of the throat. Hold the head of the kitty till the pill gets swallowed. Check once or twice to ensure that she has swallowed the oral treatment. You can also rub her throat to ensure that the treatment is swallowed by her. 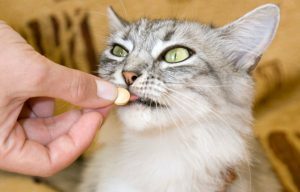 Once the oral treatment has been swallowed successfully by your kitty, reward her with a favorite food or toy of her choice. 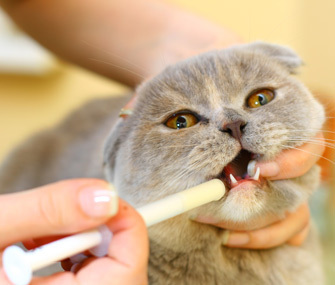 Place the tip of the syringe in the corner of your cat’s mouth. Then squirt the treatment in the space between the cheek and gums. Hold the head of the kitty till she swallows the treatment and then reward her with a yummy treat. Hold the pill between your thumb and first finger of the hand that is not holding the head of the cat. Utilize your middle finger to open the mouth of the cat by slipping it in between her tiny tooth and then slide the pill down the tongue’s center to the back of the mouth. Hold her head, till the treatment is swallowed successfully by her, and then give her a treat. 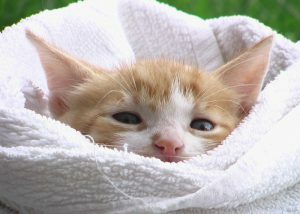 Place a thick towel across the shoulder of the kitty, and wrap downward around her neck and front legs to protect yourself, and then keep her still. You will probably need the help of a second person in case your kitty is quite wiggly. Ask the helper to hold the body of the cat while you concentrate on administering the pill. Note: Never hide the treatment in the food of the kitty as due to the bitter taste of the treatment, your feline may start disliking the regular food. The best solution is to find a food that has a different flavor than your kitty is used to and assimilate the treatment in the food. There are times when your feline would eat the food around the treatment, and leave the pill as it is. If this is the case, then you will have to administer the treatment orally or find another option. Nowadays, pill pockets / treat wraps are used by cat owners to conceal the pill or capsule in the food. It is in a cup shape and hence, it is much easier to place the treatment inside and seal it. You can then offer it in the form of a treat to your kitty. But, initially start by practicing some empty pill pockets, so that your feline is less circumspect of this new treat. There are also other treatment options available in the market like getting treatments with a pleasant flavor e.g. tuna or chicken. The loophole of these treatments is that they have shorter expiry dates and are more expensive than pills. But many cat owners find it convenient and easier to administer to their felines. Then there are treatments that are available in the form of transdermal gel. It needs to be applied topically on the skin rather than orally. Typically, they are applied on the inside of the tip of the ear. Note: Not all transdermal gel treatments are well-absorbed by the kitty’s skin. Hence, it is very important to test how your kitty would respond to this form of treatment. Always use gloves or finger cots, while administering this treatment on your kitty, as it can be absorbed by the human skin along with cat skin. There are also certain treatments that are available in injectable form. They can be given through an IV or vein and may sting the kitty badly. These treatments need to be administered in the presence of a professional like a veterinarian, veterinary technician and not at home. The best thing would be to ask your veterinarian aid you in selecting the best treatment that works for your kitty as he/she would be able to tell you what is best for her health. Every pet owner has its own views about the best flea preventive treatment available in the market and in a way they are entitled to have their opinions. But when pet owners start to raise questions and doubts about the effectiveness of a product then it becomes a problem. In this write-up, we have tried to raise the question “Is the power of one of the leading flea & tick preventives lost its potency?” If yes; then how and why? Frontline Plus has been one of the best-selling flea and tick preventive treatments since a very long time. It was going strong as far as sales were concerned in recent times, but now it has been observed that a lot of pet owners have queries about the ineffectiveness of this flea and tick preventive product that can be seen on discussion forums and other mediums on the internet. So is Frontline Plus still effective against fleas and ticks? You will get an answer to this question later on this write-up. Let us begin with the real reason for using Frontline Plus at the very first place – to kill adult fleas and ticks along with their complete life cycle. Fleas are small, wingless jumping insects that feeds on the blood of mammals. They enjoy warm, humid environments and transmit diseases through bites like plague and myxomatosis. 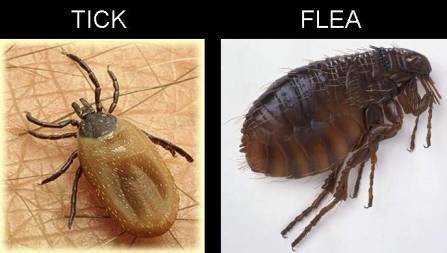 The entire flea life cycle takes from 18 days to 20 months to complete from egg to adult and interestingly only 10% of this time is actually spent by fleas on the pet. The length of these parasites is 1/32 inches and so you can only see flea dirt which is a dark, gritty particle or speck that can be seen on the pet. It is a lethal combination of dried blood and flea feces. These parasites can be seen on the base of the pet’s tails, on the belly, behind the ears and between the toes. Pets can acquire cat scratch disease, flea allergy dermatitis and plague from flea bites. Ticks are blood sucking parasites that attach themselves to pets so that they can feed on them. They can be commonly found in wooded areas, brush, shrubs, and wild undergrowth. Ticks cause lots of health problems like Lyme disease, Rocky Mountain spotted fever and tick paralysis. An adult tick can lay approximately 1,000 to 3,000 eggs at a time. In two to seven weeks’ time, these eggs hatch into larvae. Then the larvae searches for a host to feed on. Ticks are most active during early spring to midsummer. They usually attach to the pet’s body where there is little to no hair like head, neck, ears and feet. They use their scissor like mouth parts to make a slit in the skin while attaching to the host. Then they insert a spiny tongue into the incision and start feeding on the blood of the host. There are certain ticks that even secrete a substance that acts as a cement to help them remain attached to the host. Since you are now aware about fleas and ticks and the various diseases caused by them, it is important to procure a product that can assist you in preventing these pesky parasites from harming your pets. One such product that has worked well till recent times is Frontline Plus. Let us understand the functionality of this ingenious product in details. Frontline Plus is a flea and tick preventative treatment that can be administered to dogs and cats aged 8 weeks of age and above. It not only kills adult fleas and ticks thereby preventing life-threatening flea and tick borne diseases, but also eliminates the entire life cycle of fleas thus preventing re-infestation. It contains two active ingredients – Fipronil and (S)-Methoprene. Fipronil is useful in killing adult fleas and ticks, while (S)-Methoprene contains Insect Growth Regulator (IGR) that assists in abolishing the entire life cycle of fleas. Once this product is administered on pets, all fleas get killed within a day’s time and ticks within 2 days. This monthly treatment provides long-lasting and effective solution for protecting your pets from flea infestations. But, recently we have been receiving feedback from our customers about the ineffectiveness of this product on their pets. Let us divert our attention to some of the complaints of the customers and the issues they faced after administering this treatment on their pets. It has been several months since my 3 month old puppy had a tick enclosed in his leg. I administered Frontline Plus for dogs on him and he became lethargic, slept the whole time and gave up eating. Initially I thought that he had gotten sick due to the tick bite, but with time I realized that it was an after effect of the treatment. He has recovered quickly, but I still see lots of fleas and ticks on his body and it is now time to dose him again. Should I continue with Frontline Plus? Will the reactions worsen after each new dose? Or is it a sign that my furry pal is recovering? I have been getting Sentinel Spectrum for my 2 Border Collies. But recently I saw a special offer on Frontline Plus and bought this product. I had the worst experience till date as my hair gel is more productive than this treatment!! Not only do my doggies still have fleas, but their frequency has increased. I have sprayed my yard twice, but still no effect. The problem started when I switched to Frontline. I threw away the remaining 2 pipettes of the treatment in garbage and purchased Sentinel Spectrum. Now my furry pals are free from these pesky parasites. I have had a very positive experience with Frontline Plus but in September last year due to an early infestation of fleas my moodle, Johnny was so agitated due to these pesky parasites. I gave him a flea wash within 2 weeks after administering the treatment which gave him some relief, but to my astonishment the fleas were back within a week. This product is a total waste of $$ the fleas are back. I have now shifted to Comfortis and my furry pal is free from fleas. So why Frontline Plus does not work well? Let us try and find out some of the reasons for the ineffectiveness of this product. Why Frontline Plus Is Not Working Recently? If you reside in an area that is heavily infested with fleas and ticks, it is very difficult to wipe off the entire population of these pesky parasites. The problem is that the new pests in the environment can easily take the position of the already killed pests. Hence, you still see these parasites on your pet’s body. Remember, the level of infestation and area plays a significant role in successful flea and tick control. Fleas in certain areas of USA have developed immunity to Frontline Plus. Pets residing in these areas may not respond positively to the treatment hence, it fails to eradicate the flea and tick problem. Remember, any flea and tick preventative treatment is effective in killing 95 to 98% of parasites, but the new fleas still remain untapped. Hence, it is recommended to combine Frontline Plus with a short term flea treatment like Capstar for killing all fleas. Frontline Plus gets water resistant after 2 days of administration. So, if you bath your pet or take him in the water before that it can hamper the effectiveness of the treatment. Too much of washing can also result in reduced effectiveness of the treatment. 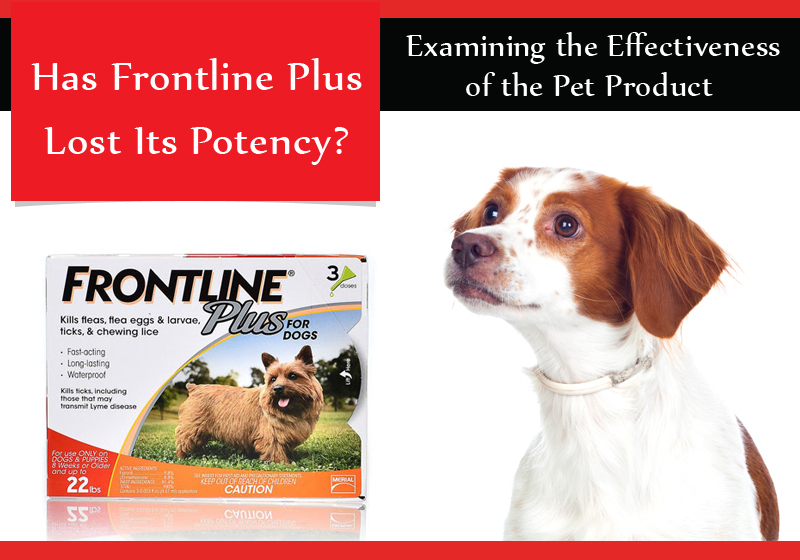 How You Can Boost The Effectiveness Of Frontline Plus On Pets? In the end, it is safe to say that Frontline Plus is still one of the best flea and tick preventative treatments available in the market; and with the handy addition of Frontline Gold now your pets can enjoy enhanced protection from these pesky parasites. So, don’t lose faith and continue administering the treatment on your pet. If you face any problems, do let us know by posting your question and we ensure that all your concerns and doubts are resolved with utmost satisfaction. What Type of Best Puppy Chew Toys For Teething Puppies ? Chewing is a natural canine behavior at any time. If the puppy is teething, means he is losing the baby teeth and new teeth are coming and growing in those big shiny adult ones. This time for the puppy can be painful and very challenging. Puppies teething tends to peak between the age of 8 weeks and 6 months. As your puppy starts teething, you might have seen that he needs some or other thing to be in his mouth. Your puppy may start chewing you furniture, squeaky shoes, sticks, rocks etc. So you need to make sure that your small doggy has an alternative choice of toys to his own chewing things. 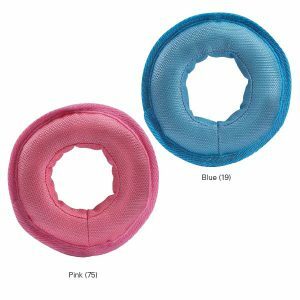 Your pup should has lots of safe, sturdy and durable teething toys. Puppy teething toys should be safe and made up of durable materials. Toys should not be sharp and pointed it may injure your pup. Choose the toys according to your Fido’s size, breed and personality. Don’t give small toys to large puppies or he may swallow it. Do not give large toy to small pup as he may be not able to play with it. For medium to large breed puppies especially who are mouthy breeds, choose the larger size of durable teething toys. At teething time your pet gets the irresistible urge of chewing gnawing, biting and munching on everything because his gums are sore, very itchy and felling uncomfortable. So you need to look a toy for him which can help your puppy to relieve the discomfort and pain by chewing it. The toy should not be to hard or thin plastic, sharp or brittle. This is made up of durable plastic. This is in the shape of key. These rings are just good fun for your Fido. Puppy holds the key in their paw tightly for a fanatical chew fest. This toy is made up of slightly soft rubber for teething puppies. You just need to load it up with some treats and toss across the room. The Kong pounce in unpredictable way when it lands, providing endless enjoyment and relieving the pain. This flexible chew toy is designed for the puppy teeth. This toy is in star shape and have all other types of pattern on the each of the star points. Mostly the Fido choose particularly one pattern of the star on which he is comfortable, giving him relieve from the pain and itchiness. This makes your pup to chew on it constantly. Remember to give the toy according to your puppies breed and size. Give the chew toys of best quality or your puppy may be having problems which you have not even thought of. So make sure you give your Fido the best chew toy. Allow your pup to chew on a variety of objects which offers best and safest dog chews that are naturally, healthy and long lasting. 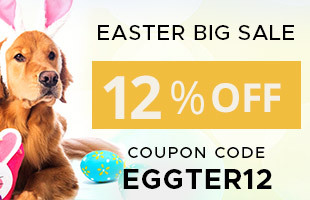 Every pet owner wants his pet to get the best of the resources for a healthy being. This also includes healthy, reliable diet. But with so many different pet food companies looking to capture business it becomes very difficult to gauge whether the pet products are indeed worth it or not. One of the conundrum that pet owners face is getting reliable information. How To Read Pet Food Labels? When you look at this word at the first thought it would seem like a cliche word; but that is not the way it is. In fact, natural pet food according to Food & Drug Administration (FDA) means a product that does not have any chemical changes in the ingredients. Remember, a diet that does not contain chemically-altered food can be potentially beneficial for pets. USDA has special seals for food that distinguishes whether it is organic or not. If the pet container has “Organic” mentioned on the food label it means that at least 95% of the ingredients present in the food are organic by nature. By organic, it means an ingredient or food that does not contain any genetically modified organisms or GMOs. If the food labels contain the words “Made with Organic ingredients” it means that a minimum of 70% of ingredients present in the diet are organic. There are certain companies that define respective ingredients as organic on their label list; but if less than 70% of the ingredients are organic then the food will not have an official USDA seal. AAFCO has defined some criteria for healthy and balanced pet foods. That contains two words “All Life Stages” and “Adult Maintenance” which assists pet owners and companies. “All Life Stages” is for puppies or pregnant dogs and consists of higher concentration of calories, calcium, protein, and other nutrients. “Adult Maintenance” is specifically for fully-grown dogs and is apt for their daily diet. The supplemental food can have varied definitions depending on the source. But traditionally it means that the food just augments but not replaces the regular pet diet. Hence, never confuse a pet food for supplemental use with the one that needs to be given for daily consumption. Before getting supplemental food, check with your veterinarian whether it would be beneficial for your pet.